A strange sort of root-over-rock. You might imagine that it started more or less like other root overs, but because the rock is so small, the roots grew under it and pushed it up, while also growing around one side and creating a firm grip on the rock. Though I originally thought the result might simply be an happy accident, upon reflection I think it was the intention of the original artist 40 to 50 years ago. * It's just too perfect the way most of the rock, particularly the bowl is left uncovered and even emphasized. Continuing with our Root-over-rock theme from the last two days. The photos and some of the text featured here are from Peter Tea’s blog ( August, 2012). Peter has been featured several times here on Bark. Close up. Such a unique look. The rock is well chosen with it's mini pond (for small birds and other critters to grab a drink?) and the nebari might be best describe as gnarly. Or maybe gnarled? Or both. The back is pretty impressive too and quite similar to the front at a glance. Though looking a little closer, the differences begin to stand out. Rock swallowed by roots. 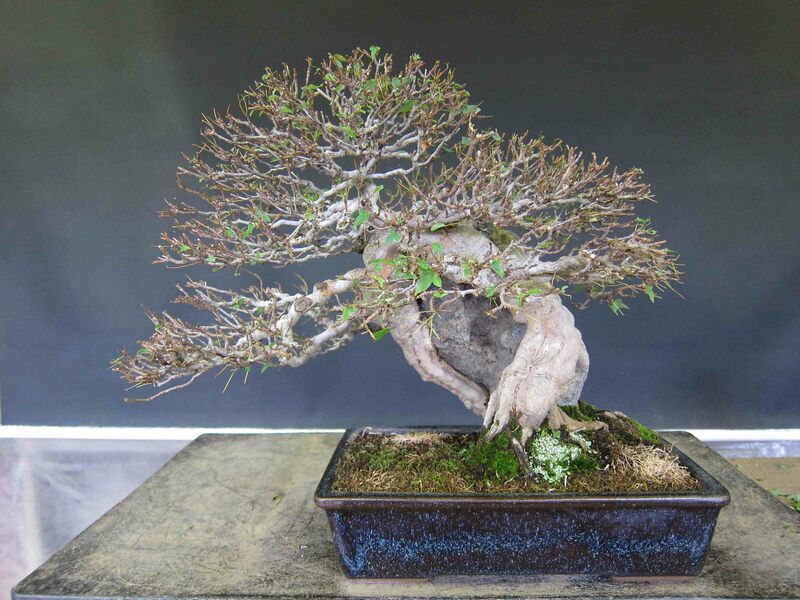 Another Trident maple from Peter's post.